Why Buy Triple Net Properties? Buying a single tenant net leased property is and investment property that has all the same inherent tax, leverage and hedge benefits as buying other investment properties, but it's much different than buying an apartment building. The items which are considered "nets" are: taxes, insurance, maintenance, and in the case of absolute net, everything other than the rent paid to the landlord. Absolute Net: An absolute net property is one where the TENANT pays all the expenses directly to the debts- including the rent which is paid to the LANDLORD. In this scenario, the LANDLORD gets a rent check every month and is not required to do anything else. The TENANT pays the taxes directly to the federal government, the insurance directly to the Insurance company and handles all the maintenance directly with the service contractors (including the utilities). Absolute Net is the most headache free investment in real estate and includes properties like ground-leases. Absolute Net is also sometimes called "True Triple Net." Triple Net Properties are not much different than Absol;ute Net, except that sometimes the LANDLORD has some small expense, like being responsible for the roof or structure of the building. Usually this is not something that creates a monthly issue but being responsible means repairing or replacement when the time comes. Double Net Properties are where 2 of the 3 nets (taxes, insurance, maintenance) are the responsibility of the TENANT and 1 of the 3 is the responsibility of the LANDLORD. Single Net as I am sure you can imagine is where 1 of the 3 nets (taxes, insurance, maintenance) are the responsibility of the TENANT and 2 of the 3 is the responsibility of the LANDLORD. The term Gross Leased is used when the TENANT pays one amount to the LANDLORD and the LANDLORD is responsible for paying and taking care of everything else. Now then, once we know what type of net leased property we want to buy, the next thing to consider is the CREDIT RATING of the TENANT. The better the credit rating of the TENANT, the lower the risk of default, the lower the CAP RATE and basically the return on investment. A 7-Eleven (who's credit rating is AA) will typically sell at a few hundred basis points lower CAP RATE than a Dollar General (who's credit rating is BBB-). 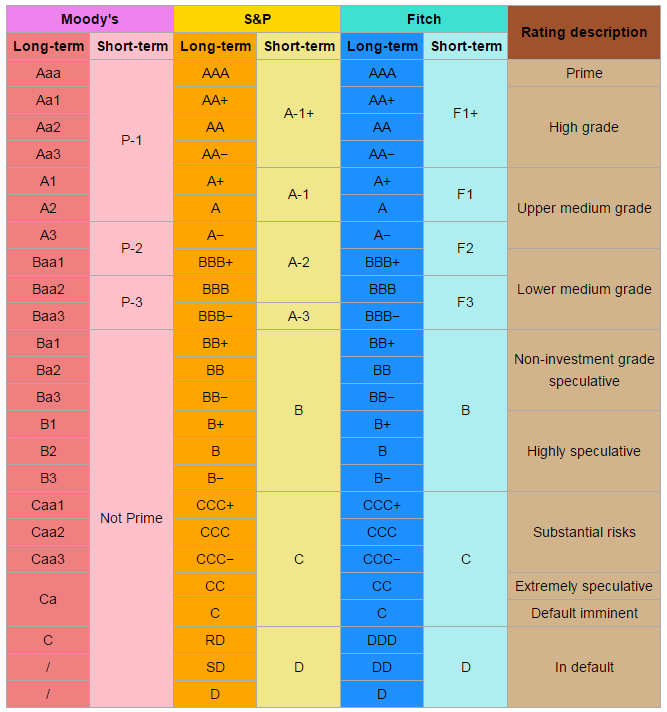 Below is a chart of credit ratings. BBB- is the lowest credit rating for a category known as "investment grade." This category is really just a way of understanding what the lowest credit REITs and FUNDS will invest in - and in my opinion the lowest any investor other than high net worth investors and speculators should consider. The last criteria to consider is the length of the lease. Some TENANTS will sign 50 year leases - but that's not what you necessarily want to buy. Typically any investor should consider 10 years as the threshold for the minimum time frame, but there are exceptions. The benefit of a 20 year lease is that the property can be held for 10 years and essentially have a second life with another investor - meaning it's value will be higher due to the term. So now that we've identified the key aspects of Single Tenant Net Leased properties, let's talk about why buy them? No Headache. One of the key reasons these properties are purchased is the no-hassle passive quality of this asset. When buying Triple Net (NNN) or Absolute Net, the investment earning power is possible with little or no time-investment. No fluctuation, very little risk. The nature of "investment grade" net leased properties is that the leases are backed by the credit worthiness of the company not to default. This means that generally a TENANT would need to go bankrupt in order to default. Many Investment Grade companies are public companies, making the default low risk.